Summer camp is often thought of as a place of fun- where lifelong friendships are made and kids have a chance to learn new things. That’s exactly what I found when visiting Camp Immokalee this summer. Immediately I was greeted with a sense of community, and I could tell that the kids shared a special bond with one another as they worked together with teammates in their daily activities. Camp Immokalee is a First Coast YMCA resident camp where kids can participate in physical, social and educational activities such as fishing, canoeing, talent shows, archery, arts and crafts, and other teambuilding activities designed for personal enrichment. YMCA of Florida’s First Coast also partners with the Bridge of Northeast Florida in order to provide Camp Immokalee stays for Bridge program participants. 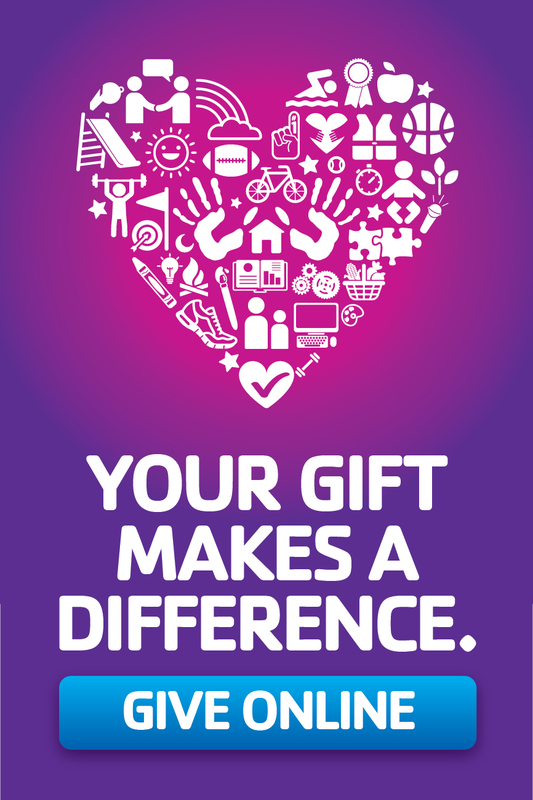 The partnership is annually funded by the Deerwood Rotary Club and makes it possible for kids of diverse backgrounds to have opportunities that they might not otherwise have access to. Camp Immokalee is one of the ways that the Y hopes to impact kids of our community, teaching them self-reliance, a love for nature and the outdoors, and the development of attitudes and practices that build character and leadership, and meaningful relationships. 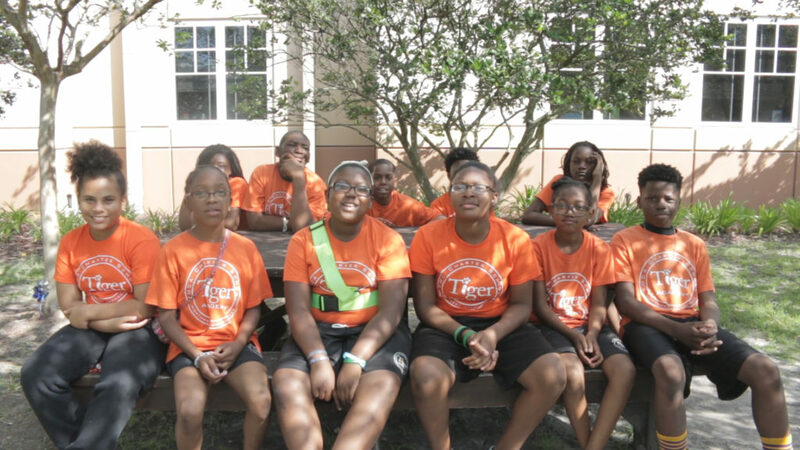 For more information about camp Immokalee or other camp programs, click here. 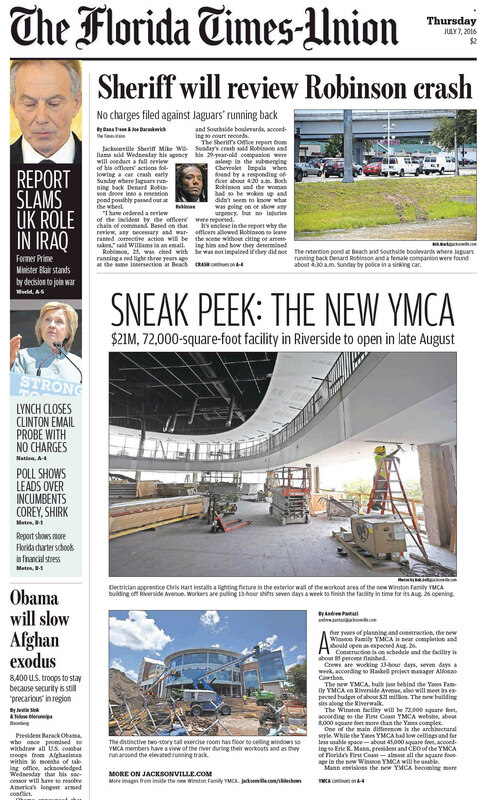 After years of planning and construction, the new Winston Family YMCA is near completion and should open as expected Aug. 26. 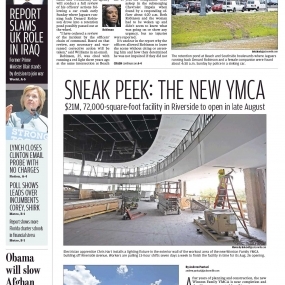 Construction is on schedule and the facility is about 85 percent finished. Planning to host a kid-friendly July 4th bash or summer party? Try these quick fixes for turning high-sugar, low-activity rituals into fresh ideas and healthy fun! Kids are sweet enough without added sugar. Redefine dessert by showing off fruits and veggies in a fun way! Slice up a thirst-quenching, naturally-sweet melon and invite campers to dig in. Watch these instructions to get started. Kids who burn more, learn more. Rather than celebrating with a movie (passive connection), choose a pool party (active connection) for kids to interact and be stimulated. They will also sleep better after physical activity. Provide opportunities for families to bond and strengthen their social-emotional and cognitive development. This may work best at the end of the camp day or during pick up. Involving camp staff in play is also a good way to stimulate interpersonal skills and connection. Blazing summer heat didn’t deter 10-year-old Destiny Gonzales. A participant in the summer program at Dupont YMCA, she wanted to make sure the thirsty seedlings she had helped to plant would thrive. As a part of the SEEDifferently program initiative started at the First Coast YMCA with Atlantic Urban Beach Farms, summer program participants like Destiny have learned the value and importance of gardening through use of hydroponic growth towers. 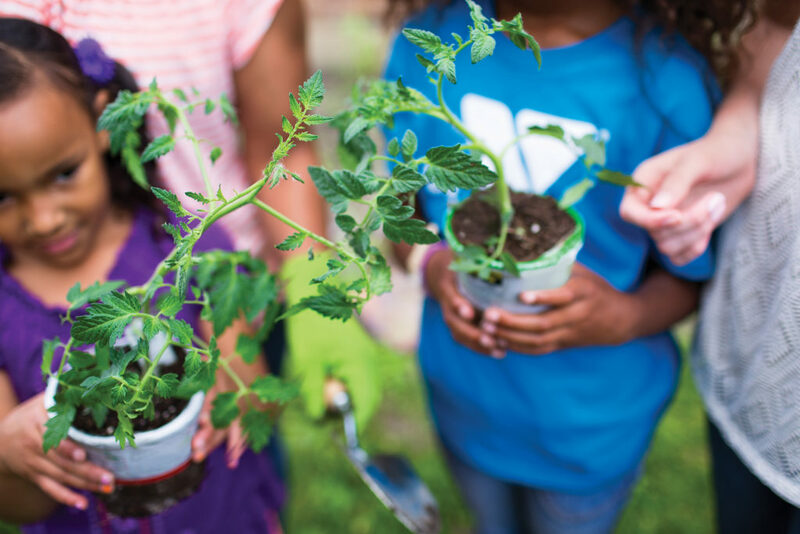 The ultimate goal of SEEDifferently is to increase interest in the gardening process amongst children and families while teaching about nutrition, sustainability, diversity, and the importance of a healthy lifestyle. Destiny became interested in urban gardening after seeing the towers one day while at the Y. “I remember watching [it], and me and my friend went up and asked if we could help”, said Gonzales. “I just remember looking at it and being intimidated- it was this beautiful structure and I didn’t have any gardening experience”, said Katherine Cox as she recalls her first time seeing a growth tower. An AmeriCorps worker, Cox explained that the science behind the unusual-looking towers is what makes the process revolutionary. “The 6 feet tall cylinder structures recycle water, take up little space, and are relatively easy to maintain. After seedlings are planted, produce forms within 3-4 weeks, making it much more efficient than traditional soil-based gardening methods”, she explained. Cox has seen SEEDifferently bloom into a program that has really positively impacted families in our local Duval community who do not have easily obtainable and affordable nutritious foods available. “I realized that food deserts and food security was a really big problem”, said Cox. In order to help, she decided to create a harvest lottery for families- drawing names and donating fresh produce that was grown on site. Soon other YMCA staff and schools in the community (including Tiger Academy Charter School) began learning about the initiative and have also implemented Seedifferently and harvest lottery programs. With increased access to beaches, lakes and pools, summer fun can quickly turn to danger for kids across the country. 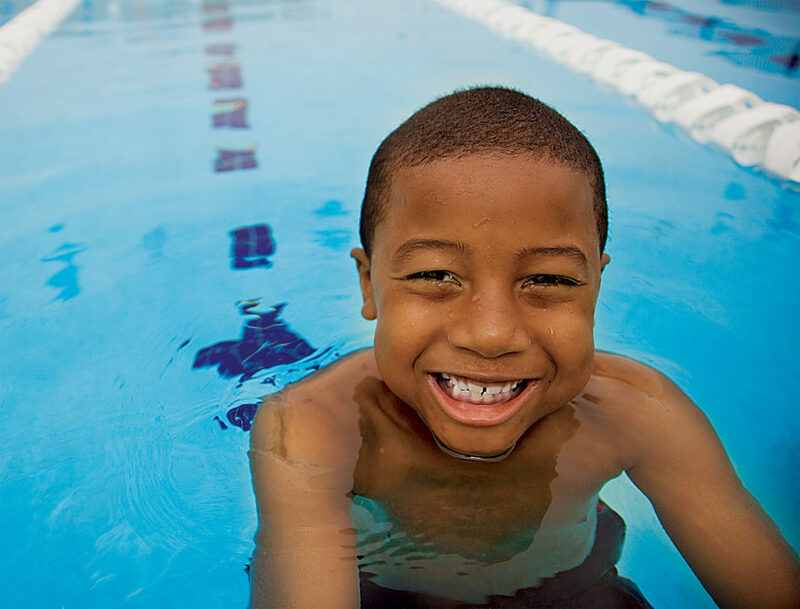 Swim lessons are an important youth development opportunity that ensure young children have self-rescuing skills, but adult supervision is always necessary when it comes to water safety. Looking for more tips and support? The YMCA is committed to nurturing kids’ full potential by keeping them safe during summer camp and every day year-round. Click here to learn more about our Safety Around Water swim programs. Inspired by a Mother’s Day sermon over 100 years ago, Sonora Louis Smart Dodd wondered why there was no similar holiday for fathers. One of six children, Dodd’s father was a single dad and she felt he and others deserved to be honored. After securing support from ministers in Spokane, Wash., her idea came to fruition with the first Father’s Day celebration at the Spokane YMCA on June 19, 1910. Many years passed before the day became a national holiday, but today we use the day to honor the fathers and father figures in our lives. 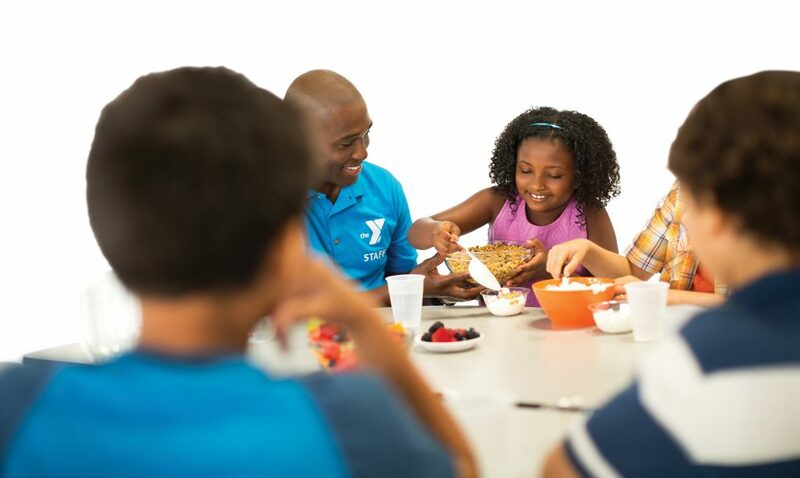 On Sunday, June 19, the YMCA of Florida’s First Coast joins the nation in celebrating Father’s Day and recognizing the influence fathers and adult male role models have in children’s lives. According to the U.S. Census Bureau, 24 million—or one in three—children live without their biological fathers. Societal factors such as unemployment, work-life balance or a lack of resources can affect a father’s ability to seek support in strengthening his parenting skills and becoming more engaged in the lives of his children. Studies show that children with close relationships with their fathers and other adult male role models have more self-confidence and exhibit less depression, perform better academically and engage in significantly less drug and alcohol use. 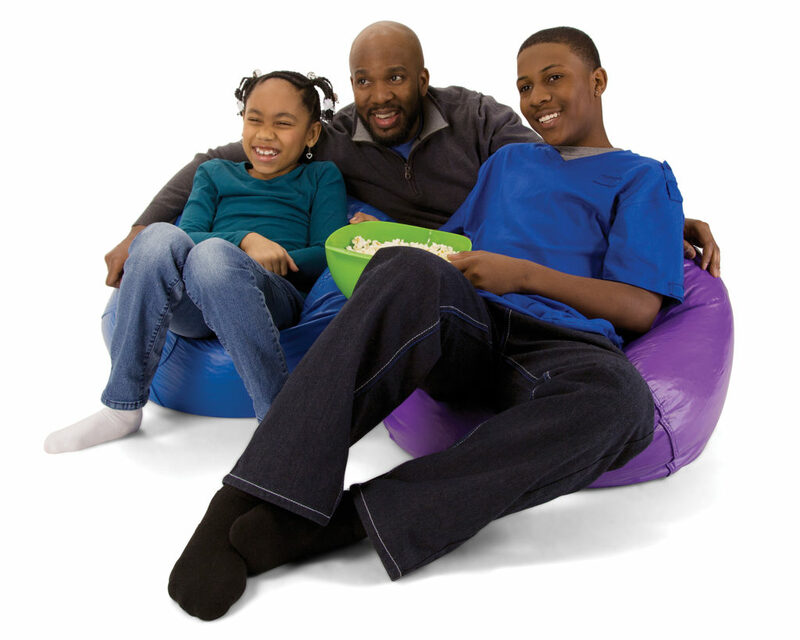 The Y, a leading nonprofit in fostering positive youth development, is dedicated to providing both resources and opportunities for fathers to further involve themselves in the well-being and development of their children. The First Coast YMCA offers a variety of programs that foster understanding and companionship between children and their caregivers. 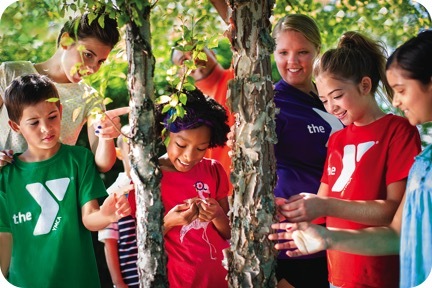 In communities across the country, the Y is committed to ensuring that the 9 million children and teens in YMCA programs reach their full potential by helping them grow—physically, mentally and socially—from young children into active, engaged members of their communities. The Duval County Department of Health is crafting a plan for health improvement in our area. 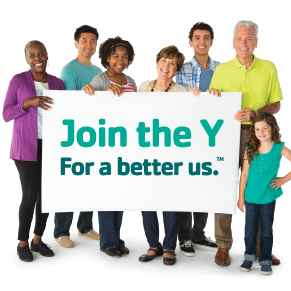 The YMCA of Florida’s First Coast supports the mission of the initiative, which is to promote, protect, and improve the health of Florida residents through involvement of community partners. The plan for improvement will target 4 strategic areas, which include access to care, behavioral health sciences, chronic care management, and community engagement and partnerships. We realize that health care providers and public health officials are not the only parties accountable for impacting and improving our health- we as the community also share responsibility to become informed and empowered about our well-being. The process for improvement starts with you! If you are a Duval resident, please click here and take three minutes to complete the linked survey. By sharing previous experiences, and current expectations, your survey responses can help Duval County to shape healthcare in our community for the better. To learn more about the Duval County Community Healthcare Planning and initiatives, click here. Tiger Academy principal Charles McWhite stood looking at a giggling group of huddled 5th graders. 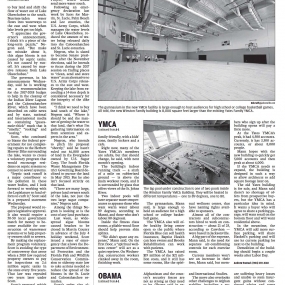 “I’ve watched them grow from four-year-olds to big, tall, middle-schoolers to be”, said McWhite. Tiger Academy is a free public school that is a part of a unique partnership with the Johnson Family YMCA, and a total of 33 fifth grade students will be a part of their June 16th, graduation ceremony. This graduation, however, will be especially bittersweet because within the graduating class is a group of fifth graders who have been with Tiger Academy since day one. For these students, they will be saying goodbye to staff and classmates that they’ve known for a big part of their young lives. After a just few moments of observing these students, it became clear that the fifth-graders weren’t just classmates- they shared a much deeper bond. “They feel like a family,” said McWhite, as he expressed his thoughts that it is Tiger Academy’s emphasis on personal and social responsibility that was responsible for the fifth graders’ success. 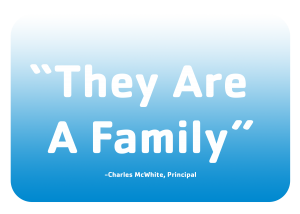 Additionally, having strong family involvement makes for a unique dynamic for students, and it has helped them to grow and flourish for the length of their time at Tiger. Bearing the motto of “Tigers Today, Leaders Tomorrow”, the school focuses on character development, while also holding rigorous academic standards for its students. McWhte highlighted that it’s these standards and leadership values that will continue to help the fifth-graders to be successful in their long-term academic careers. Although the reality of saying goodbye has set in for the graduating fifth grade class, they are happy to be moving forward to achieving their goals. The YMCA of Florida’s First Coast extends warm congratulations to this year’s graduating class! In summer, when many students lose regular access to books, the challenge to keep teens engaged in reading can be difficult. All First Coast YMCA summer camps dedicate quiet time to solo and group reading programs for young children. But how can you help high schoolers foster a love of books? Most teenagers are addicted to technology—and this can be a great place to encourage reading. Help teens move away from only reading text messages and focus on real texts—eBooks and online articles count! Learn more here about the reading habits of tweens and teens. Be prepared! Bring reading materials on field trips, including magazines or the local newspaper. Having young adult books or short stories within arm’s reach can help teens pass the time before they resort to posting selfies. Invite teens to take the lead by having a monthly book club where they get to select an appropriate book and lead the discussion. Encourage them to post photos of their books and share suggestions within their social media networks. The benefits of reading will help prepare teens for college and adulthood with stronger skills in: communication, spelling, grammar, writing and vocabulary. We Were Liars by E. Lockhart. This list was compiled with help from Chicago Public Library librarians. Have a summer reading suggestion? Tweet it using #BestSummerEver. 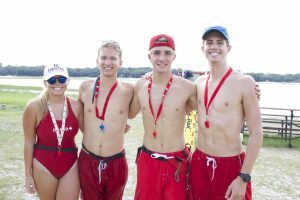 Enjoy Summer Fun in the Water, But be Safe! Every summer I feel the same nervous anticipation about my girls. By the end of this summer, I know they’ll be darting through the water like fish, but right now — because their bodies grow every year — it could take some time for them to readjust their movements and techniques to become comfortable with the way their ‘new’ bodies now work in water. I learned that last year, when teaming up with the YMCA of Florida’s First Coastand its Safety Around Water program, to get the message out about swimming safety and teaching kids life-saving swimming skills. ….To read the rest of the article, click here.